There’s no denying that WordPress Statistics is the most popular content management system in the world. What started off as a personal project is now an integral part of the internet’s architecture, powering hundreds of millions of websites. Ready to be baffled? Then just read on. As we are sure you will soon agree, the stats below are nothing if not impressive. To paint as accurate a picture as possible, we tried to include the most current statistics. If not stated otherwise, all numbers are from 2016. 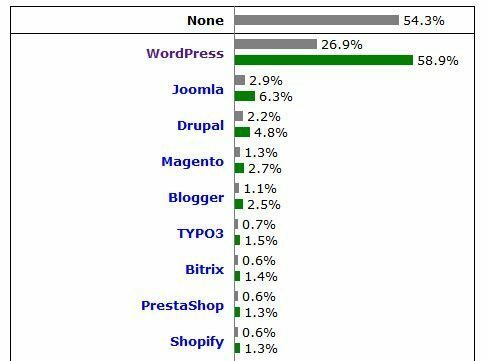 As already stated in the beginning, WordPress is by far the most popular CMS on the web. However, you might not be aware of just how popular the platform has become. First of all, its market share among all content management systems is close to 60 percent. What’s more, its closest competitor Joomla (here is a comparison of the two CMS) is used by only 6.3 percent. Yes, that’s the second most popular content management system in the world! The bigger surprise, however, and by far the most impressive WordPress usage statistic is that 26.9 percent of all websites on the web now use WordPress. With more than one billion websites online today, I’ll let you do the math on how many sites in total that is. I know, I was as surprised as you are! You read that right. In 2016, blogs that are part of the WordPress network (meaning blogs hosted either on WordPress.com or externally-hosted WordPress sites that have the Jetpack plugin installed) published on average 24 blog posts per second. That comes down to 1,481 blog posts per minute, 88,888 in an hour and just above 2.13 million per day. And that’s not counting those sites for which WordPress cannot collect any statistics. 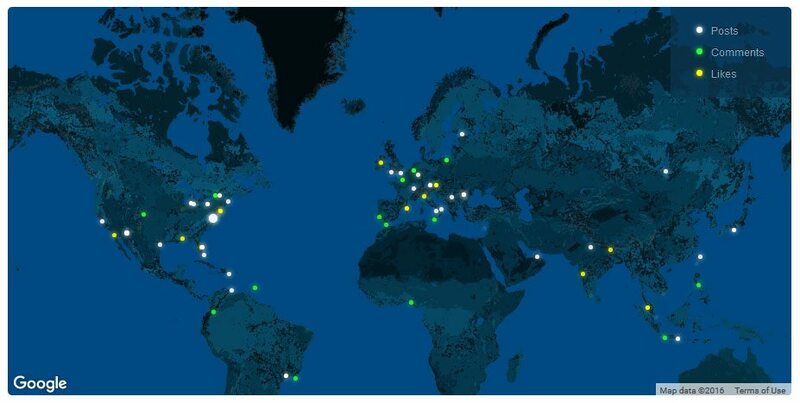 To get a better impression of what this looks like, WordPress.com offers a map that lets you see updates around the world in real-time. It appears that all of that activity is paying off, resulting in massive traffic. For this year alone, blogs on the WordPress network have garnered a combined average of 22.17 billion page views per month. That’s three times as many as there are people on the planet! Let that sink in for a minute. And man is those visitors a talkative bunch. Each month of this year produced on average 46.6 million comments. Looks like there are some fierce discussions going on out there. Plus, these are legitimate comments, which made it through the spam protection, mind you. If the Akismet stats are any indication, the number of spam comments generated at the same time is about 30 times higher. 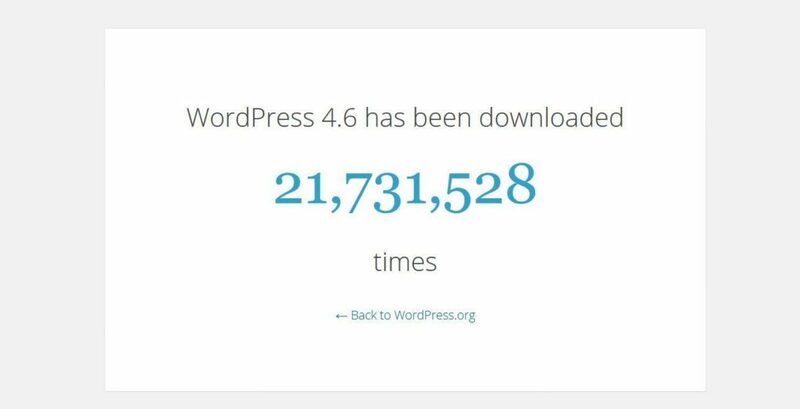 That means besides the legitimate comments WordPress blogs receive every month, they get bombarded by 1.4 billion spammers at the same time. Jeez! WordPress Statistics. Seeing the amount of data WordPress.com alone can handle, it is unsurprising that WordPress is so popular and continues to garner attention. The platform’s growing esteem is also reflected in its Google searches. In the United States alone, “WordPress” as a keyword receives 450,000 search requests every month. Globally that number is up to 2.7 million. That’s not even taking into account people looking for “WordPress templates,” “WordPress plugins,” and other WordPress-centric information. Overall, WordPress-related terms (including those for “wp,” a common abbreviation for WordPress) receive somewhere between 10 and 100 million global searches every month WordPress Statistics. As for how the platform stacks up against its competitors: Google Trends sees WordPress 5.5 times more popular than Joomla and almost nine times more in demand than Drupal. Seems like the WordPress usage statistics will only continue to grow. However, thanks to the large community and the work of a multitude of volunteer contributors, that number is sufficient even for the development of WordPress’ self-hosted variety. The latest iteration alone, WordPress 4.6 “Pepper”, has been downloaded 21.7 million times and counting. To get an impression of just how quickly this number grows, watch the handy download counter. And it doesn’t stop here: WordPress’s next (major) release is scheduled for December 2016. In the past, WordPress has often made headlines due to hacked sites and security concerns, something which its makers try hard to address quickly with new and improved versions (for more security measures, learn how WordPress sites get hacked and what to do about it). However, not all WordPress users share this approach. While download numbers for the latest version are impressive, overall there are a lot of outdated sites running with WordPress out there. W3tech states that only a little more than a 40 percent (40.8 percent) has updated to version 4.6. The picture which WordPress.org paints is much the same. According to their data, the percentage of WordPress users running their site on the latest version is 37.1 percent. This much improved since 2014 when that number was at just 11.4 percent, however, users should still learn why and how to update your WordPress site. Alright, this might be by far the smallest number on the list, but its significance should not be underestimated. Thanks to the vast community and initiatives like the WordPress Global Translation Day, the number of languages which WordPress is available in is steadily growing. From Albanian, Dutch and Japanese all the way to Icelandic, Persian and even Scottish Gaelic, you can set your WordPress dashboard to (almost) any language you like. In 2014, non-English downloads already surpassed English downloads, a number that has likely increased in the two years since. That means, by now many plugins and features first appear in another language and are translated into English instead of the other way around. This focus on multi-language support opens up opportunities for WordPress users worldwide. Plus, don’t worry if your preferred language is not available yet (though what more than Scottish Gaelic can you want? ), WordPress contributors are constantly working on expanding the list of WordPress translations. Of course, contributions from other users (like you) are always welcome! One of the main reasons WordPress is ahead of many other platforms is its extendability. Plugins are available for all means and purposes. Whatever feature you would like on your websites, in most cases you will find a plugin which can do just that. WordPress.org’s plugin database recently surpassed 47,000. While this is a far cry from the online stores of Apple and Google, almost 1.5 billion downloads are still reason to celebrate. It’s not easy to come out as the winner in a field of 47,000 contenders. Yet with more than 52 million downloads, Akismet, the popular spam protection plugin, has done just that. However, the fact that it is pre-installed in every newer WordPress build might be a factor. On second place we currently find Contact Form 7 (42 million downloads) and third Yoast SEO (34 million downloads), two other WordPress household names. The top three plugins make up for about 0.9 percent of total plugin downloads from the WordPress directory.